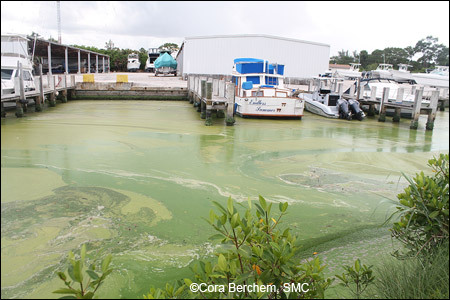 Op Ed by Katie Tripp, Ph.D.
Algae-infested waters at a marina in Stuart, Florida in July. The number of watercraft-related manatee deaths has been ticking steadily upward since the start of the year. Cheaper gas, a recovering economy, a mild winter, and a HOT summer have meant lots of boating in Florida. The current record for manatee watercraft deaths was set in 2009. That year, through mid-July, there were 58 manatees killed by boats in Florida waters. This year, through that same time period, 67 manatees have died from this cause. The number of watercraft-related rescues this year has also been higher than average. In all of 2009, 97 manatees in Florida were killed by boats. With more than 5 months left in the year, it’s highly likely that this record will be broken and 2016 will be the new record year for manatee watercraft deaths. Some will say that if we have more manatees, we should expect more to be struck and killed. We disagree. We believe that educated, compliant, and watchful vessel operators are key. Also this year, manatees along Florida’s east coast are exposed to algal blooms in the Indian River Lagoon (IRL). In the north IRL, small numbers of manatees have once again started to die from an ongoing Unusual Mortality Event that has killed more than 150 manatees and is believed to be tied to a loss of seagrass linked to algal blooms that started more than four years ago. In the southern IRL, manatees are swimming through putrid waters impacted by discharges from Lake Okeechobee. As in the north IRL, there are concerns that these prolonged blooms will shade and kill seagrass, eliminating the manatees’ primary food source (and an important habitat for other marine species). What to do with all this bad news? For boaters, we ask for their vigilance and compassion to make our water safer for the rest of this year to stave off a new watercraft mortality record. We also ask citizens to stay engaged with manatee issues as we await the decision from the U.S. Fish and Wildlife Service regarding whether it will downlist manatees from endangered to threatened on the federal endangered species list. We firmly believe downlisting without better controlling the escalating threats is premature. To heal our waters, we encourage citizens to sign the Floridians’ Clean Water Declaration at wewantcleanwater.com and the Now or Neverglades Declaration at gladesdeclaration.org. Then, contact your elected officials and ask for their commitment in safeguarding your local waters. Be sure to contact Florida’s governor, whose support for comprehensive protections of our statewide waters is pivotal. We encourage all citizens to get more involved with their local environmental groups and to share these issues with other civic and community groups, because dirty water and a sick environment not only threatens our environment, but also our health, economy, and quality of life. Most importantly, stay engaged, even when the blooms and news headlines disappear. We have a long road ahead of us to truly protect our waters and we need everyone’s sustained voice to get us there. Dr. Katie Tripp has been Save the Manatee Club’s Director of Science and Conservation since May of 2008. She received her Ph.D. in Veterinary Medical Sciences from the University of Florida, where she conducted research on manatee physiology. Demand clean water for wildlife and humans! Sign the Floridians’ Clean Water Declaration at wewantcleanwater.com. Discover manatee protection tips for boaters. Contact Florida’s governor and ask him to support comprehensive protections for our statewide waters. Write to your elected officials and voice your concerns about safeguarding your local waters. Enter your address online to find your state and U.S. congressional representative as well as your state and U.S. senators. Learn about manatee protection tips for divers and swimmers.